CPS Haze Hunter is a highly effective screen haze remover that quickly removes ghost images and stubborn screen stains. 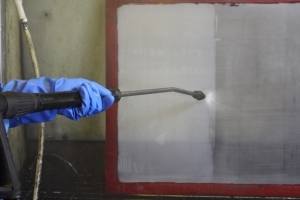 A formulated blend of strong caustics and powerful solvents is supplied as a thickened liquid, making CPS Haze Hunter easier to brush onto the screen than a conventional paste. CPS Activator G or CPS Screen Wash A6. For very stubborn stains CPS Haze Hunter can be activated with CPS EQUIVALENT NEEDED Screen Wash solvent immediately before rinsing. CPS manufactures a complete range of haze removers for all your screen cleaning needs. Screen printers don’t all use the same inks or processes. To make sure that you get the cleanest screens possible, CPS manufactures a complete range of haze removers to cover all of your screen cleaning needs.